Cheeseburger dumplings, depending on whom you ask, are either a work of genius or a sign of the impending apocalypse. 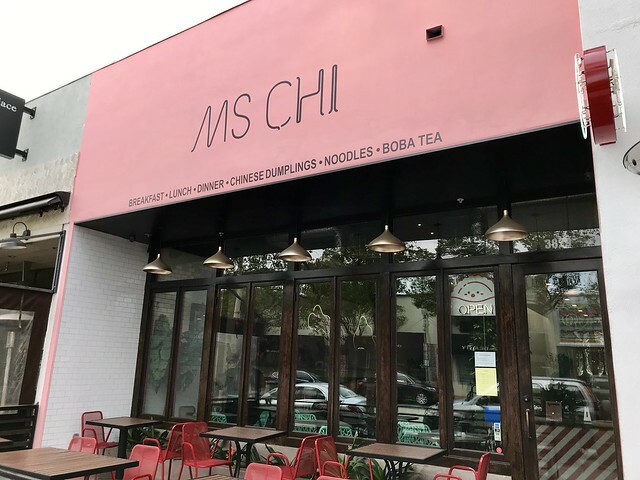 Shirley Chung, a Top Chef winner, is the mastermind behind these fusion babies, unveiled for the general public at her first restaurant Ms. Chi. Judging by the recent appearance of cheeseburger dumplings at another restaurant, she may be on to something. 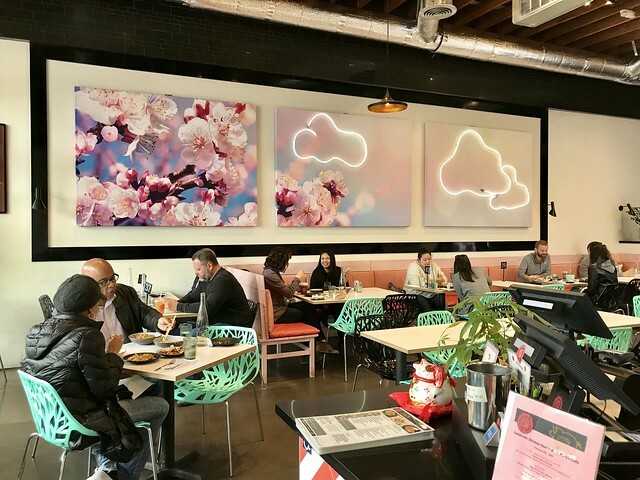 The decor of Ms. Chi is a break from the look of a traditional Chinese restaurant, announcing that this is not your typical place to get egg drop soup and orange chicken. 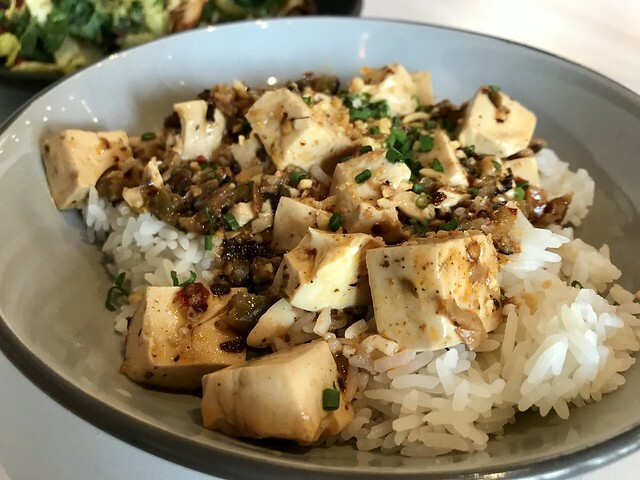 At lunchtime, it’s fast casual service, so you place your order with the cashier (who will hopefully look more engaged than ours did) and take your number to a table, helping yourself to dishes, cutlery, napkins, water and cups. 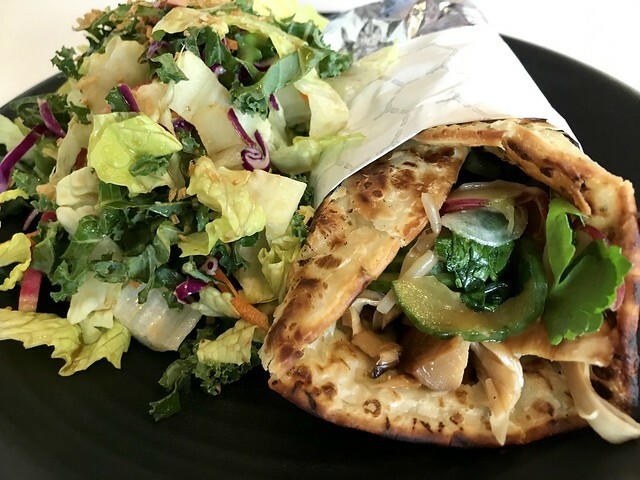 My dining partner happens to be pesco-vegetarian – removing fusion dishes like the infamous cheeseburger dumplings and pastrami scallion pancake sandwich as options. The menu did have a helpful section listing vegan dishes, from which we chose the Vegan Mapo Tofu. The tofu, which was served on a bed of rice, did not have the usual pork (obviously), but you didn’t miss it. The dish was quite spicy, thanks to those Sichuan peppers which worked their mouth-numbing magic. 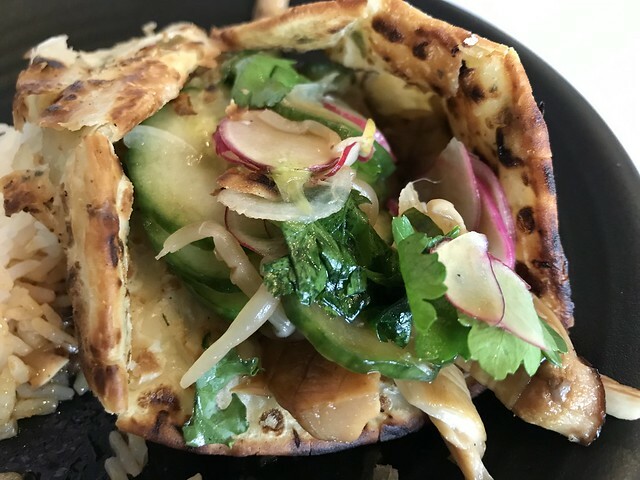 The California Monk Scallion had roasted mushrooms, vegan Doubanjiang mayo (made with fermented beans), pickled cucumbers and radishes and herbs, all wrapped in a scallion pancake. It was delicious – a dish that made you wonder why restaurants haven’t been serving it. It came with a choice of tater tots or salad. 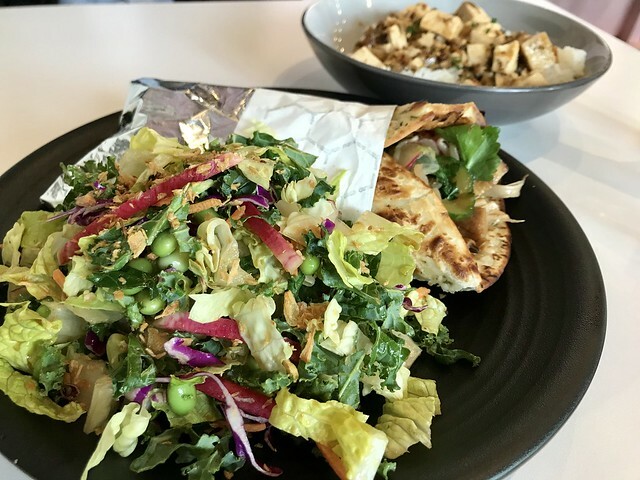 In an attempt to be healthy, we got a salad, with romaine, kale, radish, cabbage and edamame in a sesame ginger vinaigrette. In the back of my mind, I could hear my mother saying that an authentic Chinese restaurant would NEVER serve a salad, but since Ms. Chi’s serves Chinese American food, it’s all good. The portions, particularly the Mapo Tofu, are on the small side so I was a bit hungry afterwards. 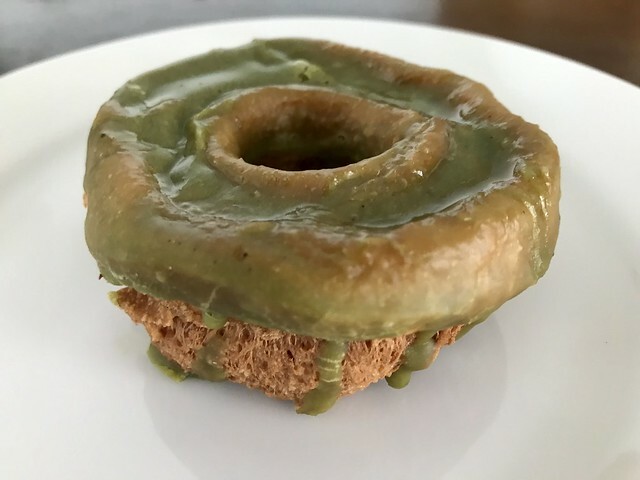 Having spared my body from the deep fried pleasure of tater tots, I could not resist grabbing a matcha mochi donut for the road. The rice flour gave it a chewy texture, but the outside was crunchy. The flavor reminded me of a Chinese donut. 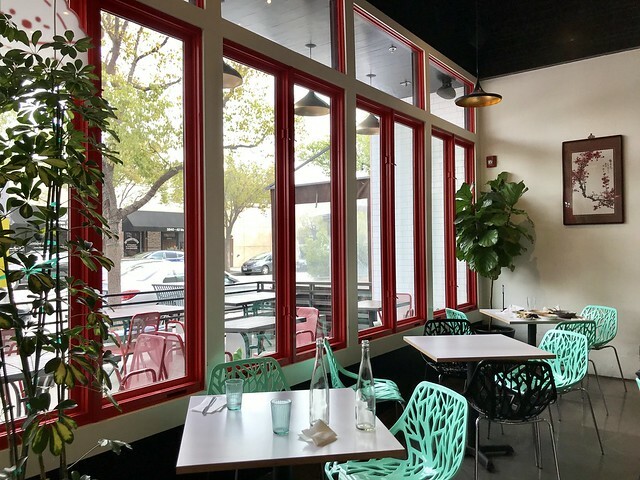 I like that Shirley Chung is experimenting with blending Chinese and American flavors and hope to try some of those dishes, like the cheeseburger dumplings, in the future. At least rumors of the apocalypse, for now, have been greatly exaggerated.